A vast thunderstorm that erupted on Saturn during the closing weeks of 2010 is still going strong. “It looks like a comet plowing through Saturn’s northern hemisphere,” reports amateur astronomer Christopher Go. 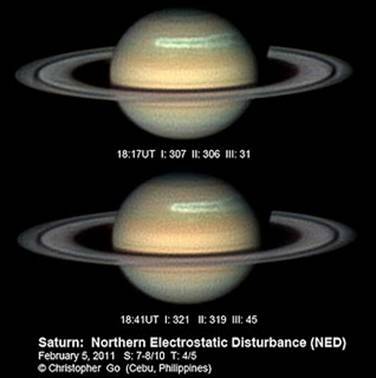 He took these pictures on February 5th using an 11-inch Celestron telescope in Cebu City, the Philippines. Astronomers are fascinated by an unprecedented phenomenal storm that is happening not here on earth but hundreds of millions of miles away on Saturn. The evidence suggests that the present super storm on Saturn is exceptionally intense and definitely out of season. These kinds of storms are not unusual on Saturn. They usually occur on average once every Saturnian year—nearly 29.5 Earth years—and appear to be linked to the summer solstice when the planet’s orbit brings it a bit closer to the Sun and its atmosphere warms a little. But this super storm started in spring. Since 1876, astronomers have observed only five other mega-storms on Saturn. “This is a one-of-a-kind storm,” said Andrew Ingersoll, a self-described planetary weatherman at the California Institute of Technology, who was part of the discovery team. I have been hearing from the corners of my ears about dramatic weather happening not just down here on earth but on other planets as well. Mars is being hit by rapid climate change and it is happening so fast, some say, that the red planet could lose its southern ice cap. Pluto also has warmed, some say, but not because of solar activity, that is for sure. And now even the sun seems to be dancing to a different tune with her recent flair of activity. Certainly we have enough problems with our own weather so who gives a hoot about storms on Saturn? 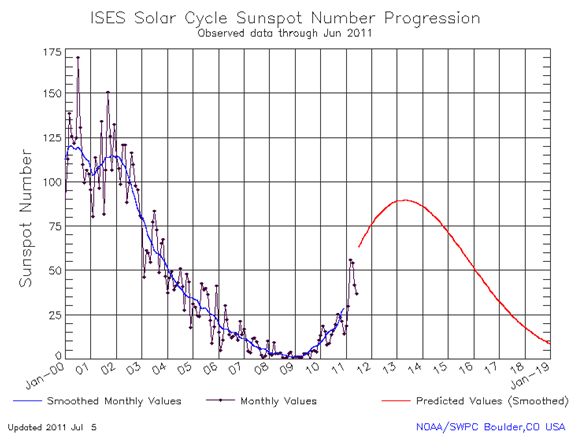 If warming is happening throughout the solar system, clearly there must be something causing it all. Those who are talking about warming happening throughout the solar system might possibly be confused because over the last 50 years, the sun’s output has decreased slightly: it is radiating less heat. We can measure the various activities of the sun pretty accurately from here on Earth, or from orbit above it, so it is hard to ignore the discrepancy between the facts and the argument that the sun is causing the rise in temperatures. If the sun’s output has leveled off or even diminished, then what is causing other planets to warm up? And are they warming at all? Is the earth really warming or is a great ice age threatening? We have catastrophic weather conditions happening with recordings of record highs and lows depending on where you are. Does not matter so much the long-term trend for the short-term trend is out of control and already cutting dramatically into the agricultural sector. There have been claims that warming on Mars and Pluto are proof that the recent warming on Earth is caused by an increase in solar activity and not by greenhouse gases. But we can say with certainty that even if Mars, Pluto or any other planets have warmed in recent years, it is not due to changes in solar activity. Future is looking cold, cold and colder though countering that is increased under and above water volcanoes. The ones underwater heat the seas but the ones blowing their stacks on land block out the sunlight with their massive output into the atmosphere. We do have some planetary position change, huge jet stream dislocation and thus the arctic area is warming considerably because, in part, the actual angle of the sun is changing. Well I don’t limit my consciousness to my navel so I took a look to see if there was anything else interesting about this storm. Since writing my four essays on Elenin in early May, people have been asking me if I have seen anything. I haven’t been looking very hard, being busy with many other things but my internal radar never shuts down. So I went back to NASA’s flight path model for Elenin and found that Elenin was in Saturn’s neighborhood. I half hoped to see Saturn at the other end of the solar system when Elenin went by her orbital path but they were close enough to call it relevant. Though by the time the storm was spotted Elenin was well past and zeroing in on the inner solar system. I have seen nothing to dispute what I reported on at the end of May about Elenin.